One of the latest things in the blogosphere are these "100 Random Thoughts About Me" posts. Well, since most of these posts were from the female race, this new phenomenom perked my interest so I decided to take a stab at it. 1) I celebrated my first birthday on April 29, 1951, in our backyard on Dusy Street in Dothan. 2) Our colored maid was named Rosa. 3) While she was ironing, Rosa taught me how to sing and dance "16 Tons". 4) I sang and danced "16 Tons" on Barbara Gellerstedt's TV show in 1956. 5) I later sang and danced "16 Tons" on the stage of the Highland School Auditorium during the graduation for Mrs. Loftin's LITTLE BO PEEP KINDERGARTEN GRADUATION. 6) When I last stayed at the Loftin's Lake Seminole cabin in March of '68, many of the adults remembered me singing "16 Tons" on television and at Highland School in the Spring of '56. 7) My girlfriends at Lake Seminole in March of '68 made me feel like THE KING OF LAKE SEMINOLE! 8) Wilson Pickett's "In The Midnight Hour" was my favorite song on the boat's transistor radio during my AEA vacation at Lake Seminole in March of '68. 9) I got to serve Wilson Pickett his supper backstage at CityFest in downtown Tuscaloosa in the mid 90s. 10) My Grandma Register lived on Jeff Street one door down from Porter's Woods which you could cut through to get to John Rainey's house on West Main by the gully near Northcutt's Drug Store. at a Colonial Dames luncheon at the country club. I may stay around Nut Patch fo' dah weekend but knowing me, I won't linger long in the CIRCLE CITY. I'll probably head back to Dauphin Island for the rest of my next vacation. BLOG last week. I'll try to make it up sometime. #9 BULLOCK is supposed to show up this week and I don't have a clue. A middle aged couple decided to stay on Hemley Road in their camper. They had been through hurricanes before and thought they knew what to expect. The small battery operated TV was tuned to one of the local stations. The weatherman announced that landfall was expected in approximately two hours. About five minutes later they heard a noise coming through the pine woods- something they had never heard before. Before they knew it their camper was under water. They somehow managed to grab their small fiberglass skiff and crawl into it with their two pit bulls and two chihuahuas. The husband stayed in the water trying to guide the boat towards the paved road. Several snakes tried to crawl up his arm to get into the impromptu ark. He swam into the right-of-way but couldn't touch bottom. The wind and waves pushed his ark North towards Highway 188. In the intersection of 188 and Hemley Rd., he finally managed to touch bottom- the asphalt road surface. They somehow made it to a friend's house that stood barely above the surging sea water. They now live in a FEMA trailer set up next to and at the same elevation of the camper that flooded. My blunt nose Stauter skiff, which was built in 1977 on the Causeway (that connects Mobile and Baldwin County) just prior to the Stauter Boat Works being destroyed in Hurricane Frederick(1979) disappeared during Katrina. The day before Katrina hit, I had taken the 14 ft. long skiff off of its trailer and filled in half full (or is that half empty, Bob) with water so it wouldn't move too far in a high wind. The boat was in the back yard on the ground which is elevated about 9 feet above sea level. I wasn't expecting a deluge. As a precaution I tied a 30 foot long anchor line to the bow and wrapped the rope around a 36 inch sweetgum overlapping the anchor. I had done the same before Hurricane Ivan last fall and the boat survived, however, full of sweetgum balls. When I was finally allowed to return to Coden (the day after Katrina) I pulled into the driveway, the house was still there and looked OK. I surveyed the yard. My aluminum jon boat was still on its trailer attached to a metal post. However the boat and trailer were facing a different direction having turned approximately 230 degrees from its original position. Wood dock pilings had been deposited on the patio in back of the house. Obviously there had been enough water to float those pilings and turn the jon boat. I looked toward the sweetgum tree where I had tied the Stauter- no boat- gone. I looked around the yard- no Stauter. My attention was then diverted to the house- had water gotten the house. I went in and sure enough the surge had inundated the lower floor of the house with about 1 and a half feet of water & bayou silt. Later after wandering around the house looking at all the ruined furniture, appliances, tools, etc. my thoughts went back to the Stauter. I walked outside and began systematically looking for the boat. I looked at the debris lines where the flood waters had deposited marsh grass entwined with other flotsam trying to understand how the surge had moved through the yard possibly indicating a direction my boat might have gone. I searched along the bayou to the West, across the road in the woods to the North- the boat was no where to be found. I came to the conclusion that it was either sunk in the bayou or someone had stolen it. I continued to search for the Stauter for several days finally coming to the realization it was gone for good. About a month after Katrina, the guy who had been flooded in the camper rode by on his new mode of transportation- a bike. He occasionally stopped by after the hurricane as we had established a new found comraderie as Katrina survivors. Somehow the conversation rolled around to my lost boat. He asked what it looked like. "It's 14 foot long, blunt nose, black and white hull, natural varnish on the interior..."
He said,"You ain't looked far enough." He told me some of his friends who are fishermen had found it during the storm and had taken it to their house on Rock Road. I jumped in the truck and drove over to their house. There was the boat leaning up against their back yard fence. I then went back to my house, hitched up the Stauter's trailer and drove back over to get the boat. Not knowing if the guys that had found it were going to claim salvage rights or whatever I was prepared for the worse. They said,"We knew it belonged to somebody!" After all, in the fishing village of Coden, a boat is a prized possession and these fishermen were happy to get it back to its owner. I asked them where they had found it. They related this tale. When the water started rising with the surge, several of them had decided to wade out towards the bayou to take pictures of the flood. While wading through the water, a second surge wave rolled up the bayou. One of the moms who was with the adventurous crew was caught by the rising water. She was over her head and couldn't swim. Two of her sons noticed my boat upside down on the side of a flooded road about a quarter mile from my house. They quickly flipped it over and emptied the water out of it. They put their mother in the boat as she was too exhausted to wade back to their house after fighting the flood water. She told me she had almost drowned. As I loaded the Stauter on the trailer, she patted the boat and said she was happy that they were able to save the boat and get it back to its owner because the boat had saved her life during the storm. I still have not found the anchor or the rope. As you can see from the photos above & below, Katrina changed Dauphin Island forever and left it with a 1.2 mile wide cut through the west end that now has a five foot channel. Saturday, I visited the west end with my friend and professional land surveyor,Greg Spies. It was a powerful experience to stand where every stick of lumber on each of over 180 homes was completely wiped off the face of the Earth and as many as 600 others homes damaged,some to the point of condemnation. Every day will bring change. If ever in your life you ever tried to live from day to day, DO IT NOW! Katrina has changed us forever and all progress from now on should be recognized each and every day. My friend Greg Spies took time to record some of his memories of Katrina for "TURNING POINTS", the newsletter of the Alabama Society of Professional Land Surveyors http://aspls.org/ . I heard these stories back in the middle of October and I am happy that Greg shared them with us this week. In fact, back in the middle of October, my son, Christopher, & I were the first ones to take Greg's newly recovered 1977 14 ft. STAUTER skiff http://www.stauterboats.com/ out on Portersville Bay over to Isle Aux Herbes (Coffee Island) and Pointe Aux Pines (Point of Pines) http://www.dcnr.state.al.us/public-lands/stateLands/foreverWild/FWTracts/Grand%20Bay%20Savanna%20Addition/ , then up to see the crowded harbor of Bayou La Batre, and finally past Coden Bayou along the loop over to Fowl River. December 17, last Saturday night, I had the opportunity to help cook a pretty good meal in Greg and Collette's FEMA trailer there at the foot of the bridge in Coden. The po' little gas stove can barely get hot enough to cook french fries in a skillet. We boiled the shrimp on a fish cooker[They're catching 9 and 12 count head-on @ $4 a pound this week] and grilled the red snapper in an open smoker. I am really gonna enjoy putting Greg's Katrina stories out on the Web! While surveying Lots 7-10 in Rolston's Addition to Coden (circa 1910) a few weeks after Katrina, I was carefully avoiding stepping on upturned nails in a debris field of shattered houses strewn in the woods just north of Portersville Bay. Incidently, this subdivision is located about 0.7 mile from my house on Bayou Coden. I noticed a 1 X 10 board that had been painted white about three feet long covered with sea weed and marsh grass. I flipped the board over with my boot and scraped off the flotsam. Routed into the other side was the number 2515. Obviously someone in the past had taken the old board and made it into an address sign. I flipped it back over and proceded in search of lot corners. As I stumbled through the debris field, the number 2515 stuck in my mind. 2515? All the roads and streets in Coden were 12000 this and 8700 that. There were no addresses with a 2000 number that I could recall. Then it dawned on me. 2515 Bienville Blvd. 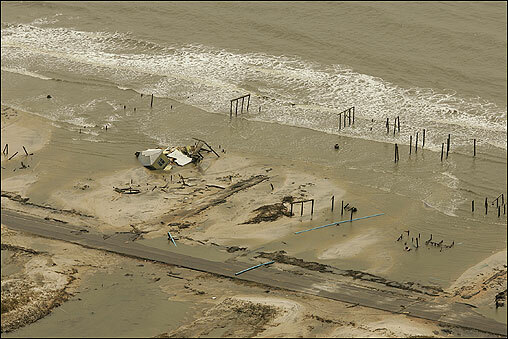 on the West end of Dauphin Island- last fall I had surveyed a lot just to the west of 2515 Bienville. The debris field took on a new character. The beach house that had been on Dauphin Island was scattered through the woods in Coden. I picked up a photograph lying amidst the broken joists and trusses. A Father and two sons were proudly holding up the catch of the day. I later calculated how far the broken beach house had traveled with Katrina's wind and surge. 2515 Bienville had made it 9.3 miles across the Mississippi Sound on a heading of N 24 degrees W before disintegrating into Rolston's Addition to Coden. A new city is emerging along the I-12 corridor between Slidell and Covington. Pay attention to this development. I predict that the building of this new city north of Lake Ponchartrain is far more important than anything anyone will ever accomplish in the sad ruins of old New Orleans. The relocation of many New Orleans, St. Bernard and Plaquemines residents to the Northshore has provided a windfall in sales tax collections for St. Tammany Parish. The St. Tammany Parish Sheriff’s Office said tax collections in Slidell were up nearly 50 percent in October over the same month a year ago. Mandeville’s take increased 47.66 percent and Covington’s was up 53.86 percent. Areas of unincorporated St. Tammany had sales tax collections soar 80.59 percent. Officials said that in addition to the increased population, some of the increase was due to delayed sales tax collections in August and September. “With the influx of new residents in our area, we fully expect to see slight increases in tax revenues that will be the foundation for a better, brighter St. Tammany Parish,” said Sheriff Jack Strain. Southeast and Southwest Louisiana are changed forever due to the devastation brought about by hurricanes Katrina and Rita, state Sen. Ben Nevers of Bogalusa said Wednesday. Some areas of the state have been thrust forward 10 years into the future in terms of population growth, economic opportunity and stress on local infrastructure.For example, the population of St. Tammany Parish increased by more than 100,000 people in just a few weeks, he said. The population of Tangipahoa Parish has grown considerably. Some of that increased population will be retained by both parishes and will create the requirement for infrastructure that may not have been needed for another five to 10 years. Other areas have been thrust backwards, maybe not just a decade or so, but possibly forever. Cameron and St. Bernard parishes were devastated, he said.